Does this book have its flaws? Sure, in the same way a beautiful summer’s day has flaws. Oh no, I’m a little sweaty and it’s making my hair stick to my neck. Oh dear, my hand is sticky because my ice cream is melting on it. If things like these are enough to spoil summer days for you, then perhaps you’re from some alternate universe where most days are perfect in every single way. Likewise, if the flaws to be found in Temeraire (or Her Majesty’s Dragon if you live in other parts of the world) are enough to ruin the book for you them you must be accustomed to some truly spectacular books, and I envy you. Truly, I can not remember the last time I encountered a book that was so much fun to read. Naval hotshot Laurence finds a dragon egg, and when it hatches the baby dragon, Temeraire, latches onto to him. (Think imprinting ala Twilight, but with a bazillion percent less creepy lameness). Laurence is yanked from the navy and sent to the Dragon corps where he and Temeraire learn to fight crime Napoleon. Enjoying this book was effortless. And yes, sometimes when something requires effort you end up loving it all the more intensely (like my oft mentioned favourite House of Leaves), but sometimes you just want to enjoy something without having to try. And all this talk of Temeraire being easy to read is not a slight against the book, although I can how you might read it as such. You might be picturing characters who are little more than archetypes, short hand stand in for familiar tropes that we know so well we don’t have to guess at their motivations. Perhaps you think the plot is so obvious one barely needs to read the words to know what will happen next. Wrong! Our hero Laurence is a complex fellow, and not always one hundred percent likable. He’s not a twenty first century man wandering around the seventeen hundreds like many characters in historical fiction seem to be, he is entirely true to the time period (or how I imagine the time period, as truly I am no expert). He is a stuffy and a stickler for rank, he balks at the idea of women in the workforce and heaven help anyone who doesn’t address him with enough respect. But he’s a good man and a fine leader, strict but fair and all that. And it doesn’t hurt that I suspect he’s rather dashingly handsome. The plot itself, while nothing groundbreaking is certainly not predictable. While you’re always pretty sure that Laurence and Temeraire will come out ok (because there’s like thirty more books in this series) there are moments of genuine concern for the well being of other characters. Admittedly nothing much seems to happen for a great part of the book, it’s mostly Laurence and Temeraire getting to know each other, kind of like the pilot episode of a sitcom. I suspect Novik knew she would be writing more books in this series, and so saw no need to rush things. In the final quarter however things really go mad, with some nicely foreshadowed plot developments playing out and some pretty crazy dragon v dragon air battles. (Novik really excels as concise, clear and exciting battle descriptions, with is a rare skill that should always be valued). The only real complaint I can lay against this book is the dragon Temeraire seems just a shade too perfect. He’s the rarest most uniquest most bestest dragon in all the world that can do things no other dragon can, and more! But you know what, I’m gonna let that go to. Reading the exploits of super awesome Temeraire reminds me a lot of the unabashed joy in the scene in the first Harry Potter book where Harry flies for the first time. 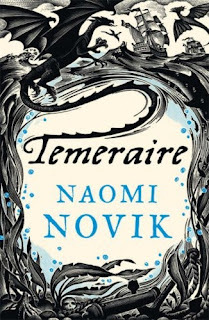 There can be something really enjoyable in watching a character excel, and with his occasional petulance and revolutionary leanings Temeraire isn’t entirely perfect. Not entirely perfect is true for the book as a whole really, but you can be damn sure that I await the further adventures of Laurence and Temeraire most eagerly, and I’ll let you know if installment two is as much fun as this one. Now that's a crappy review of a crappy book. YA books I have loved, and loved well.